Authors: Michael Kiesling & Wolfgang Kramer ~ Find It! Publishers: FX Schmid, 1999; Rio Grande, 1999 ~ Torres is a strategy game of castle building and knights. 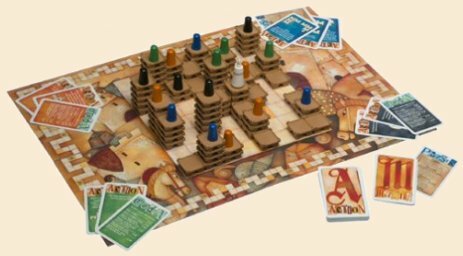 Demonstrate your abilities as a clever castle builder on several levels! Use the building blocks to build the castles and then move your knights into the top scoring positions.